We love pulaos. It is a tasty and easy to prepare lunch or dinner recipe. 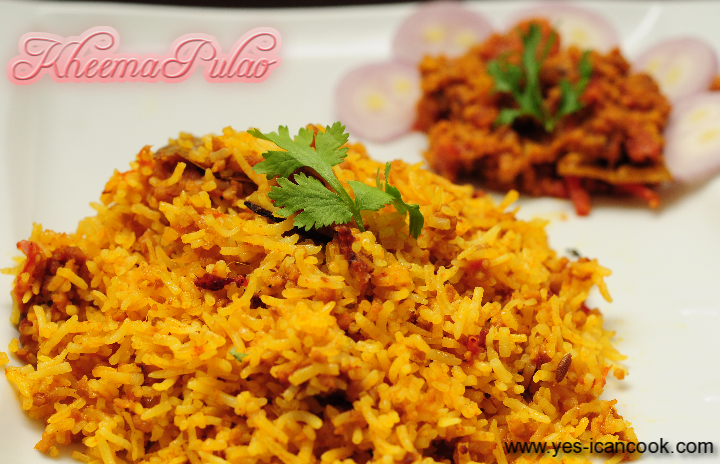 It is very close in taste to biryani which keeps the crave to eat biryani under control. I very rarely make biryani, probably just for eid, bakrid and a couple of times but I make pulao every week. I make pulao with chicken, mutton and prawns. 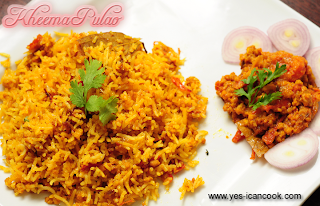 I had made kheema pulao a long time ago and it was awesome. I had kheema that I wanted to use up so made it again for lunch and we loved it. I will now be making it more often. 1. Clean and wash the kheema well. Drain all the water. I use a thin mesh colander for this. 2. Heat oil in a cooking vessel. 3. Add cloves, cinnamon and cardamom. 4. Add bay leaf and caraway seeds. Fry for a minute. 5. Add the sliced onions and green chillies. Fry till the onions start to brown. 6. Add the kheema without any water. Break it with the spoon while stirring to avoid lumps. 7. Kheema will release water. Fry till it turns white and the water has almost disappeared. 8. Add ginger garlic paste and fry for a minute. 9. Add salt, turmeric powder, chilli powder, coriander powder and mix well. 10. Add the yogurt and mix well. 11. Add the tomatoes and let it cook till the tomatoes turn soft and are well cooked. 12. Reduce the flame to low, cover and continue to cook with regular stirring. Add a little water if there is any sticking to the base or burning. 13. Wash the rice gently without breaking the grains and soak it in water. 14. In a separate cooking vessel bring sufficient water to boil to cook rice. 15. Add salt and 2 teaspoons of oil. 16. When water begins to boil vigorously add the soaked rice. 17. Cook for 8-10 minutes till rice is half cooked. Drain the starch and keep the rice aside. 18. Add coriander leaves and mint leaves to the kheema and mix. 19. Cook kheema till oil starts separating and there is very little gravy. 20. Turn off flame and remove the kheema in a bowl leaving some in the vessel. 21. Add half of the cooked rice on top of the kheema. 23. Add a layer of the kheema. You can retain some of the kheema to serve separately with the pulao. 24. Add a layer of the remaining rice. Drizzle again with oil. 25. Cover and cook over very low flame for about 6-8 minutes till there is steam formed. 26. 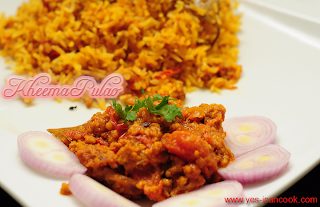 Switch off flame and mix the rice with the kheema gently after it cools down a little.